Home NEWS Has The Crypto Craze Killed The Marijuana Investing Buzz? Has The Crypto Craze Killed The Marijuana Investing Buzz? What do India Globalization Capital, Inc. (NYSE: IGC), Seven Stars Cloud Group Inc(NASDAQ: SSC), Riot Blockchain Inc (NASDAQ: RIOT), Marathon Patent Group Inc(NASDAQ: MARA) and NXT-ID Inc (NASDAQ: NXTD) have in common? All are beneficiaries of investor appetites for stocks with cryptocurrency connections. Does this signal a shift in dollars from cannabis stocks, which were popular with adventurous investors in 2016, to cryptocurrency? Is the market’s investment trend sustainable? Benzinga set out to explore. Shares of the infrastructure and medical marijuana company India Globalization Capital ran up over 95 percent Dec. 26 after it announced that it would use blockchain technology for product identification assurance. Companies that establish at least a vague link with digital currency are seeing huge valuation boosts. Riot Blockchain, formerly a biotech company, rallied in November after announcing cryptocurrency investments. Last week, Long Island Iced Tea Corp (NASDAQ: LTEA) gained a whopping 350 percent after announcing a blockchain play. The primary reason why crypto-linked stocks make huge moves is that the underlying assets themselves are on a tear. Bitcoin has made rapid strides in value and market cap, so much so that it has almost become recognized as a mainstream investment option. 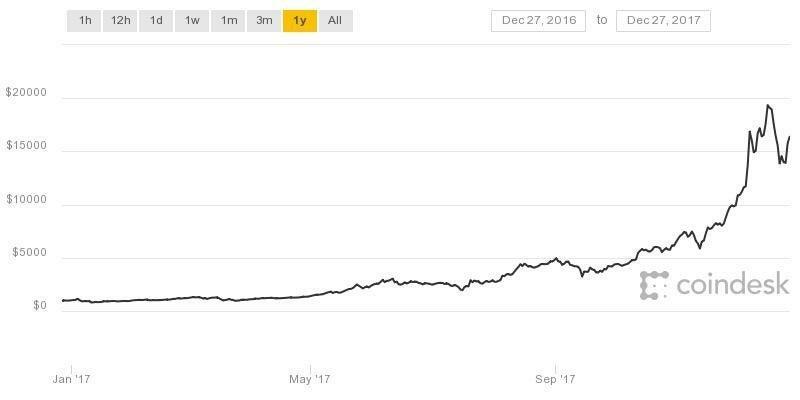 Bitcoin, introduced in 2009, has rallied over 1,500 percent over the past year and peaked above the $19,000 level in mid-December before pulling back slightly. The digital currency has a market cap of about $260 billion as of Wednesday, more than that of conglomerateGeneral Electric Company (NYSE: GE). Bitcoin is closing in on the market cap ofJPMorgan Chase & Co. (NYSE: JPM). Chase CEO Jamie Dimon has been highly critical of the cryptocurrency. Ethereum, the second widely traded cryptocurrency with a market cap of $73 billion, according to CoinMarketCap, has gained about 9,500 percent since the beginning of 2017. The market cap of all digital currencies together totals about $555.8 billion, according to CoinMarketCap. The CME Group Inc (NASDAQ: CME) recently launched bitcoin futures on its platform. The breathtaking digital currency rally has led to fears that a bubble is in the works that could soon burst. Naysayers have warned about an imminent crash on the belief that the run-up is unsupported by fundamentals and is instead riding a wave of positive sentiment. At the same time, there are people like Julian Hosp, who foresees bitcoin gate-crashing its way higher to $60,000, according to CNBC. But the cryptocurrency entrepreneur has also raised possibility of bitcoin recoiling all the way back to $5,000. Sustainable or not, crypto has managed to unseat marijuana stocks as the most lucrative investment choice in 2017. The North American Marijuana Index, which tracks the leading cannabis stocks operating in the U.S. and Canada that meet minimum trading criteria, has gained about 52 percent through Dec. 26 versus bitcoin’s rally of more than 1,500 percent. To be included in the index, a cannabis stock must have a minimum price of 10 cents, a market cap of at least $10 million and daily volume of about 20,000. The softening in sentiment toward marijuana stocks comes after a 213-percent rally in 2016. The solid performance in 2016 could be traced to strong sales of marijuana in North America, which amounted to $6.9 billion, according to Arcview Market Research/BDS Analytics data quoted by The Motley Fool. This came about as more U.S. states legalized medicinal marijuana usage, with a few even approving recreational marijuana. Activity could pick up again. Arcview’s estimates put marijuana sales in 2021 at $21.6 billion. Companies such as U.K.-based GW Pharmaceuticals PLC- ADR (NASDAQ: GWPH) have cannabis-based drugs in their pipelines, and if these treatment candidates are approved, the prospects for cannabis stocks could improve significantly. The mushrooming of marijuana companies in Canada is understandable, as the nation has legalized medicinal marijuana and is on track to make recreational marijuana legal by July 2018. The relative performance of marijuana stocks versus crypto has not been encouraging. But marijuana stocks still outperformed the broader market. Read rest of the article here.